Now, first of all, a lot of the period of Chuck Berry’s greatest chart successes were before my time, and second, Mr. Berry is so much of a legend that I doubt I could do him justice with any sort of biography. So, as I have done for at least one other legend of rock and roll, I’m not even going to try to include a full bio here. By the early 1970s, though, Chuck Berry had released several albums which had not seen much chart success. He moved back to his original label, Chess Records, and, after a couple more albums that did not chart, he released The London Chuck Berry Sessions after successful London session albums, also released by Chess Records, from Howlin’ Wolf and Muddy Waters. Chuck Berry’s album featured one side of studio recordings and one side of live recordings, from which both the album’s singles came. 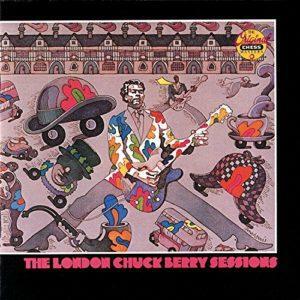 Amazingly, The London Chuck Berry Sessions was the only album released by Chuck Berry to be certified gold by the RIAA. Of course, the most remembered single from The London Chuck Berry Sessions was the first single, “My Ding-A-Ling”, which was Mr. Berry’s only #1 song in his long career. Not everyone was thrilled with the song, though. For example, Fred Bronson, in his Billboard Book of Number One Hits, described it as a “forgettable rude novelty song”. However, given the song’s success, I doubt Mr. Berry was too terribly concerned about such a characterization. The live version of “Reelin’ and Rockin'” entered Billboard’s Hot 100 at #90 for the week ending December 2, 1972 (chart | magazine). It peaked almost 2½ months later at #27 for the week ending February 17, 1973 (chart | magazine). By then, though, it had already lost its star**; indeed, two weeks later, the single had fallen all the way out of the Hot 100. In all, it spent 13 weeks on the chart and, as it turned out, ended up being Chuck Berry’s last song to reach the Hot 100. In 2016, it was announced that Chuck Berry would be releasing his first studio album in 38 years, Chuck, in 2017. Indeed, as of this writing, his website redirects to a storefront webpage selling that album. Sadly, Mr. Berry passed away at the age of 90 on March 18, 2017. Even over 60 years after his first single hit the Billboard charts, several of Chuck Berry’s songs are still receiving airplay. It would be nice to add one more to that list. * Voyager 1 had a golden record, designed to be played at 16 2/3 RPM, containing greetings in multiple languages and lots of music, but nothing else that was anything like “Johnny B. Goode”. See here for more information. ** At the time, the Hot 100 indicated singles with the greatest airplay and sales gains for that week with a star. In later years, the star was replaced with a simple oval.